The Instrument Shelf on the Pedestal is a custom job that I completed in year 1 of owning Eximius - details here. It's very convenient as it not only holds the Chart Plotter, Depth display unit and the Wind Instrument, but it's also handy to clip info sheets close at hand when at the wheel. It also acts as a handy hand hold when moving around the pedestal to or from behind the wheel. The wheel is 41" diameter. 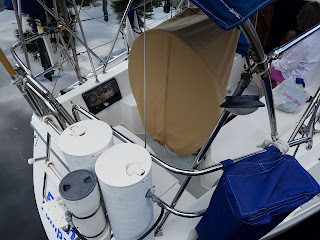 The outcome is that there is not an off the shelf pedestal cover made for out boat, so we have a compass cover (shown in the pic), a cover for the depth instrument holder & chart plotter holder and another for the wind instrument. None of them offer any cover for the pedestal or wheel, so we have to do clean up often. Hence reason for making a new Pedestal Cover. Step 1. Guesstimate the amount of material required. We took the general measurements for a cover and figured we would need several pieces. Front Piece: From the top of the Instruments, down in front of the shelf, snug up close to the pedestal guard (that's the vertical stainless steel tube structure to which the wires are tie-wrapped) and down to the base of the pedestal. Aft Piece: From the top of the wheel, down the aft face of the wheel and then down to the foot of the pedestal. It would have a vertical zipper from the top of the wheel all the way down it's length. 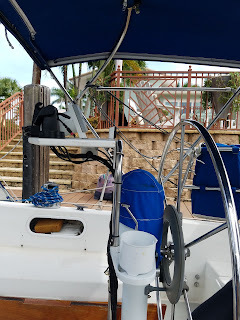 2 Side Pieces: These would extend from the top center of the instruments on the shelf and reach down to the foot of the pedestal, connecting to the Aft Piece and the Front Piece. The bottom of the cover would have a sewn in shock cord to close up the bottom around the pedestal. It might work out that the side pieces would only extend from the shelf down and that a separate 'Top Piece' would extend over the shelf and instruments, joining the Front, Aft and 2 Side pieces. That decision will have to wait till we make a template out of Dura Skrim patterning material. I also have some Tyvek House Wrap that can also be used for patterning but prefer the Dura Skrim as the transparency is useful in allowing view of what is beneath the template material. The rough measurements show that I'll need about 6 yards of 48" material. I already have 3 yards, so just need to order another 3. But will wait until we have made the pattern, too much material is OK, but not enough is pain. And now some good news! 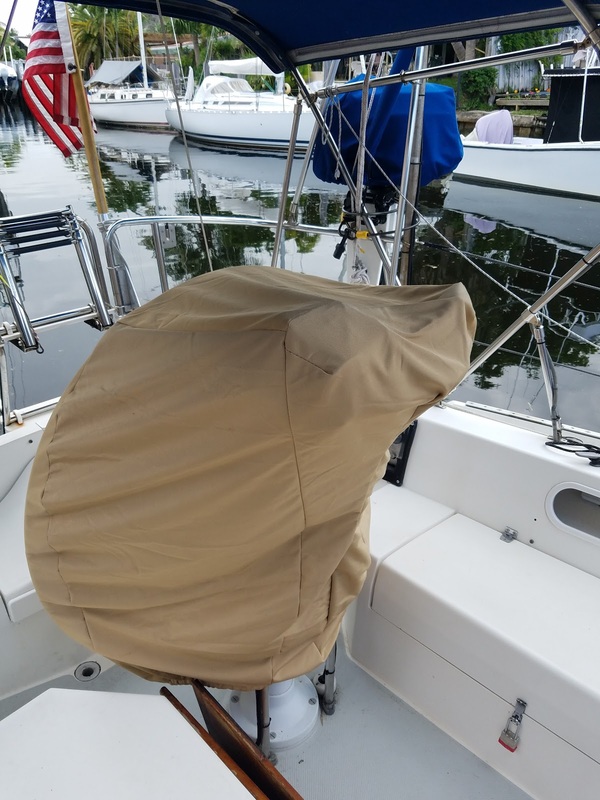 A sailing buddy gave me a box of canvas (Unlikely Sunbrella as it is faded on the outside surfaces.) that was left over / removed from a friends boat and too much to deal with at the flea market. Bonus! 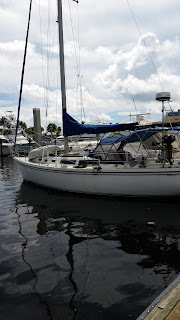 It included an old dodger & bimini that was failing (not UV thread). I was able to salvage a 50" piece of YKK Zip #10 in great shape and quite a bit of the material that is clean. We went down to the boat and used the Sailrite technique to make a template for the cover. I made the template in 4 parts. Brought them home and cleaned up the edges, laid them out on the material and marked the edges + 1/2" for the hems. I did make a mistake with the center part of the wheel where the zipper would be installed. The Sailrite video showed the need to add a 2" center piece between the port and starboard segments of the section that covers the wheel, ie. 1" to each side down the middle, for the zip. I added 2" to each segment, so the wheel cover is 1" wider than it should be. You would have to know in order to criticize the finished product. 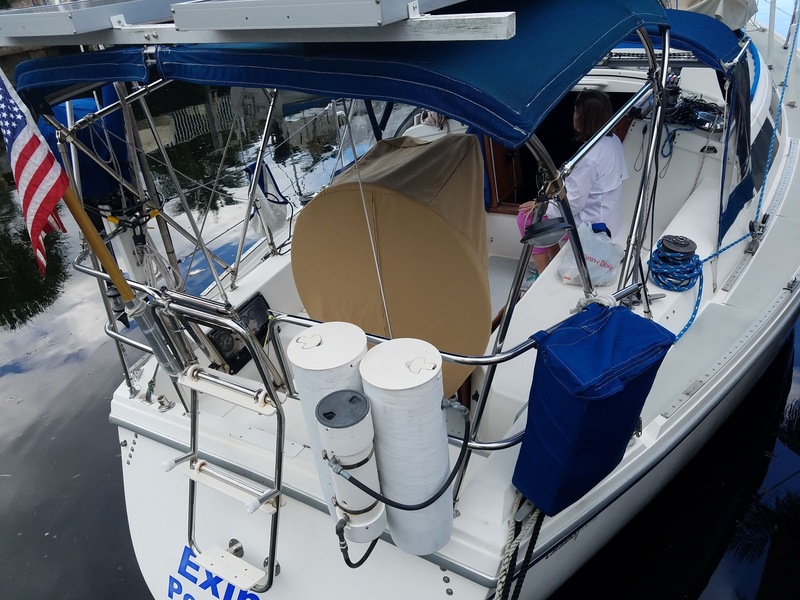 Sewing the zip was a breeze thanks to the Sailrite video and the result looks great. Sewing the segments together was easy too. I used Profilin Clear thread, that will probably last longer than the pedestal cover. I did not sew the bottom hem and the shock cord before taking the cover down to teh boat and checking that everything was ok. It was, but while there, I marked the hem in a slightly better position than when making the templates. Back home I quickly marked up the hem and shock cord lines, 10 minutes work with my machine and it was all done. When I feel like blowing the money, I may remake it in Sunbrella (sans the 1" error) but it should last a few years. Here's some pics. I know, it looks weird - but then it covers our weird pedestal and wheel. We get really heavy rain down here in South Florida, so I raised the front bottom end.